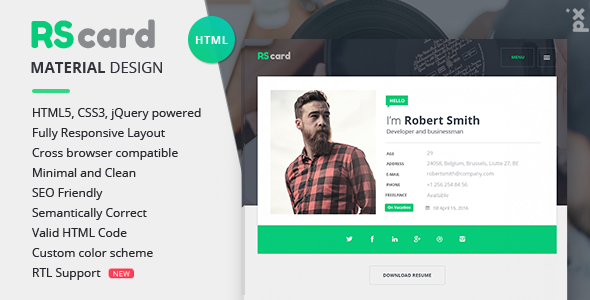 RScard – Material Design Resume/CV & Portfolio Retina-Ready HTML Template (Personal vCard) – A premium tool to promote yourself and your business! Check out wordpress theme here. Ideal template for any type of prefession as for creative studios and companies, perfectly suits for placing information about your experience, skills, education, works, awards and expertise. Clean, modern and organized looking material design and well commented, flexible code. You will be able to add and manage blog in your page as well. In the theme there are used two Google Web Fonts Open Sans and Fredoka One. Our template goes with an ability to change template color. We provide 19 predefined colors. Theme has 2 skins dark and light. We have also included a documentation folder to guide you through the code. We have covered all the important questions but if there is something that you would like to know then we will happy to help out.